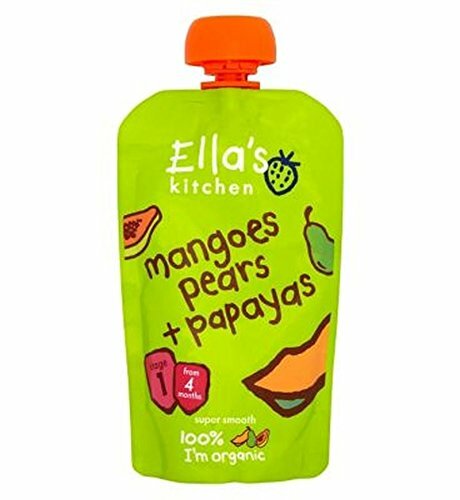 Ella's Kitchen Mangoes, Pears + Papayas from 4 Months 120g Hello, I'm 100% organic pureed mangoes, pears, papayas + a dash of lemon juice - with nothing else added, not even water.Key Key Features 100% I'm organic Super smooth No lumps or bits and nothing artificial Just yummy organic food for babies I contain naturally occurring sugars No added sugar, salt or water Country of Origin - Produce of the EU Manufacturers Address - Ella's Kitchen, RG9 4QG, UK. How to Use Suitable for Home Freezing Cannot be Microwaved Using me: Squeeze me into a bowl or straight onto a spoon. To warm me, stand me in hot water + check I'm not too hot. Never put my pouch in the microwave. Storage Keep me in a cupboard. Once opened, I can be kept in the fridge for up to 48 hours. I can be frozen - I'll be a bit cold but still taste yummy! Lower Age Limit Advisory - Months 4 Hazards and Cautions My cap could be a choking hazard to children under 36 months. Please always keep out of their reach. If I am damaged or look inflated with air, do not feed me to your baby and return the damaged pouch to us. While every care has been taken to ensure this information is always as accurate as possible, food products are regularly improved and nutrition content may occasionally change. As a result we recommend that you always read the label carefully before using or consuming any products. Nutritional Reference Value (NRV) information is based on the typical composition of the product. Guideline daily amounts are those for a typical adult (men and women). NRV information for non Boots products is calculated by the manufacturer. Boots has no control over the recipe or nutritional content of such products and information on this site may differ to that given on the product label. We would therefore recommend you do not solely rely on this information and always read the product label.